Discussion in 'Patch Notes' started by CM Kabz, Aug 16, 2017. This week we are excited to bring you not only the return of the Rulupee’s World Travel Event, but 2 completely new attendance rewards: The Burning and Guild attendance rewards that will certainly aid you in enjoying BDO to full throttle!This week’s patch is ~1.5 GB. Burning Attendance Reward has been added. Enjoy extra rewards just for being fired up to play BDO! Log-in daily and enjoy more chances to win fabulous items as well as Shakatu’s Seals! Get Together! Guild Attendance Reward has been added. Any adventurer in a medium-sized or bigger guilds is qualified to receive guild attendance reward. New Attendance Rewards for the cool summer will start. Cool down with the coolest attendance rewards this summer. Go For the Gold Event has started. Behold your gold! Golden Dagger can be dropped during Grinding. Golden Backpack can be obtained during Gathering. Golden Coelacanth can be caught through Fishing. Rulupee’s World Travel Season 2 will start soon. Click here for more information! King Clam Hammering Board has been added to Terrmian Waterpark. Receive the event quest through NPC Pataya next to the hammering board to enjoy the mini game. Abnormal current has been detected in Terrmian Waterpark bringing in new, rare fish to its waters! Tuna, Porgy, Grunt, Nibbler, Smokey Chromis, Moray, Coelacanth can now be caught at Terrmian Bay. Purchase and usage requirements for Field HQ has been changed. Blacksmith Techthon has come back from his summer vacation. He is ready to assist. The Collection panel in the Lordship Menu now correctly displays the security budget. Complete Now buttons have been added for house crafting. The button will be shown next to the Cancel button in the house crafting window, and the amount of Pearls deducted depend on the time remaining. * Not applicable to usage change and mass production. Complete Now buttons have been added for worker promotion. The Complete Now button will appear at the bottom of the worker list while worker promotion is in progress. The amount of Pearls deducted depend on the time remaining. The total number of character customization history states will now show up to 50 changes. Repair and upgrade of forts, command posts, and barricades during Siege Wars will now be decreased up to 50% depending on the player's life skill levels. 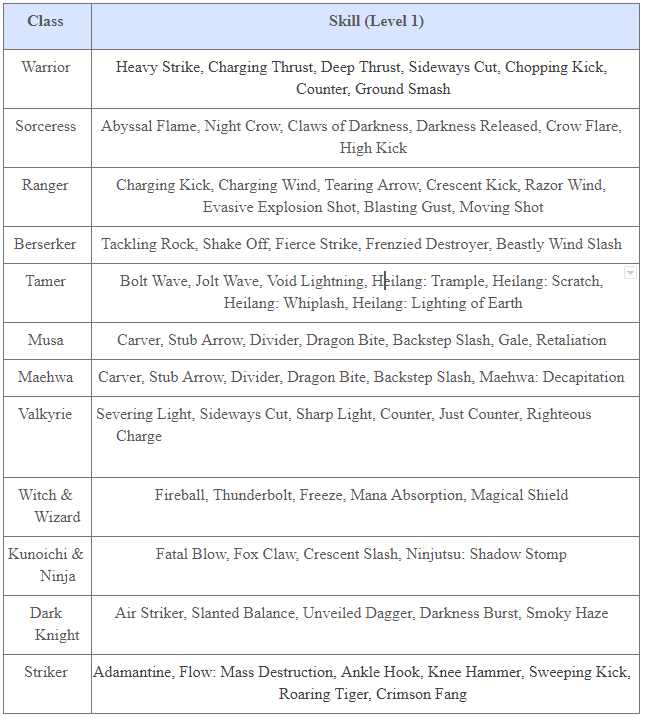 In order to allow adventurers to enjoy a variety of actions and thrilling combat, level 1 of the following skills will now be automatically learned upon character creation of relevant class. Level requirement for the following skills has been lowered. 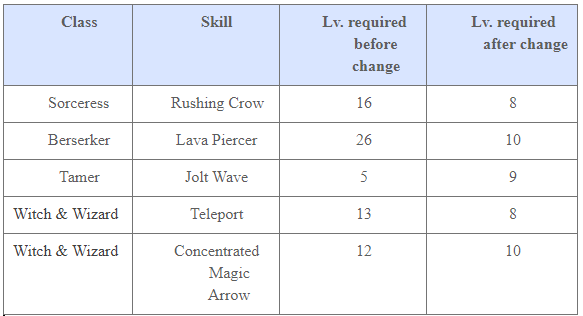 The skill description of Dark Flame II has been changed. Fixed the awkward ladder-climbing motion. Fixed the issue that made it impossible for transition into Kerispear while Sprinting on non-combat mode. Fixed the issue so that awakening weapons do not show while communing with horses on awakening weapon stance. Connecting to sprint after Flash Step (forward) became quicker. Vambrace skills can be used normally now when Spiral Cannon is used through Quick Slot during Gauntlet mode. 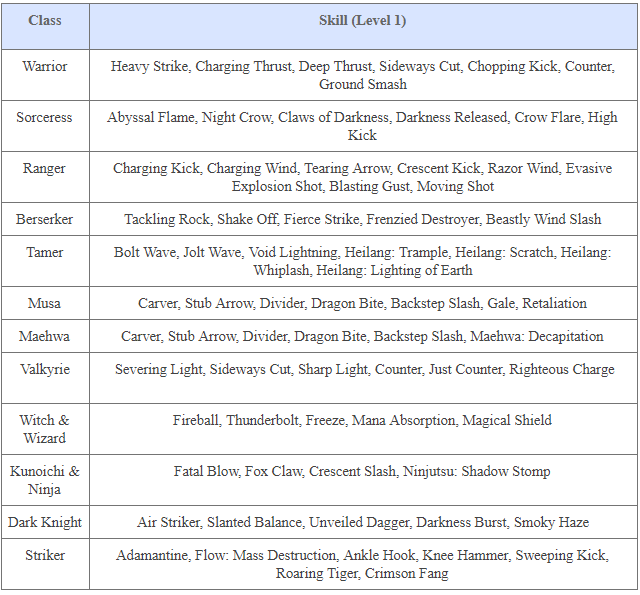 If you lock the skill command for Flash Step and Silent Step, subsequent skills activated with Martial Spirit Shards will also be locked. A new pet, Turtle, has been added to the pearl shop. A buff “Movement Speed +2” has been added to the outfit Beginner’s Serendian Soldier Suit. An accessory set “Asula’s Crimson Eye” has been added. Asula’s Crimson Eye set can be obtained in Mediah region. Enhancement and marketplace registration are unavailable. The maximum range of cannons on Epheria Sailboat and [Guild] Galley has been increased. Some monsters in Mediah received stat adjustments. Some of the monsters have higher HP and upon defeat, they will give more EXP. Even if your character’s AP is higher than the Recommended AP, this does not mean your attacks will be considerably more effective. Taboo the storage keeper and Freddie the guild stable keeper in Sand Grain Bazaar have been relocated to a more convenient location. Images of some NPC knowledge cards have been changed. The buff “Footprint of the Wind” has been added as a reward to the following main quests. “Footprint of the Wind” buff accelerates a character for 30 seconds. New Tavern quests have been added to the Altinova area. Buy quest scrolls from the new NPC Datu Varudatu to start the quests. If you have scored high Amity points with Datu Varudatu, you can buy better quest scrolls. Advanced quests are more demanding, but they offer better rewards. The cooldown time of Altinova Tavern quest scrolls is 30 minutes. Shabby Shovel has been removed from the reward list for the quest Meals Are Not To Be Skipped. Fixed issue that disabled the trash bin icon highlight when toggling mouse cursor while a message window is open. The grinding spot info for Abandoned Iron Mine, Manes Hideout, Wandering Rogue Den, Helms Post, and Elric Shrine on the world map has been changed from recommended level to recommended AP. Fixed the issue that prevented the guild history to be refreshed. A prompt has been added to notify that coupons cannot be used when purchasing items from the shopping cart. 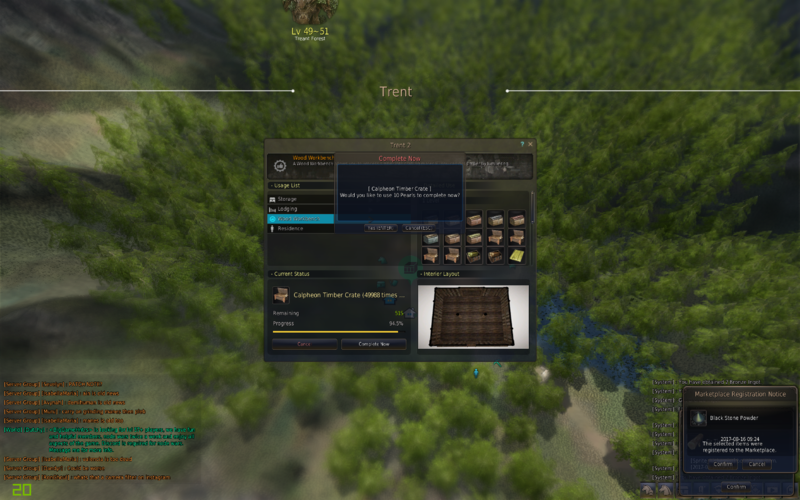 A message box will now appear if a server shift fails. Fixed the issue where a skin-headed Ninja would suddenly get fully grown hair during combat. An icon has been added to the death screen so that players can read up on information on forced PvP. A prompt has been added when selling items worth more than 500,000 silvers in towns without storage. Fixed the issue that changed the color of system message to default color when there was a linebreak. Fixed the text overlapping issue for the Guild Fund figure and nearby buttons. Fixed the graphical glitch near the high heel part of [Ranger] Queen Heart Underwear. Fixed the issue where the underwear string was invisible when [Ranger] Epheria Marine and Queen Heart Underwear were equipped together. Fixed the issue that made the high heel disappear in underwear mode after equipping [Sorceress] and [Valkyrie] Queen Heart Underwear. Fixed the graphical glitch for [Kunoichi] Eunyoo outfit. Fixed the graphical glitch at the top of Ranger’s head during character customization. Fixed the graphical glitch that happened for certain classes near the ankle area while wearing Queen Heart Underwear. Fixed the graphical glitch that showed [Warrior] Acher Armor shoulder guard to be penetrating the cape in combat stance. Fixed the graphical glitch that occurred on the chest part of [Tamer] Acher Outfit when the durability fell below 20%. Fixed the glitch of the hair accessory of [Ninja] Yurei Helmet to be floating above the character’s head if the character was bald. Fixed the issue where the aquarium on Terrminé Wagon would disappear on Optimization Mode. Fixed the issue that might have caused a delay in processing the game sound. The “suspended” issue that could happen while processing the game sound has been improved. Fixed the issue that prevented players from interacting with other NPCs after a Blacksmith NPC signed off. Fixed the issue where the client would shut down if a pop-up window is closed after character transport. Fixed the issue that skipped the level check (Lv. 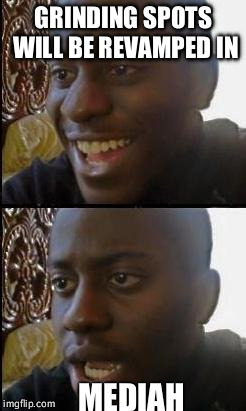 50) when connecting to the Red Battlefield server. Fixed the issue that instantly closed Arena of Arsha right after the match began. If you have the attendance reward panel open, the panel will correctly be updated after being closed at midnight. If a customization file has not been properly applied, it will be automatically try re-applying after a certain period of time. 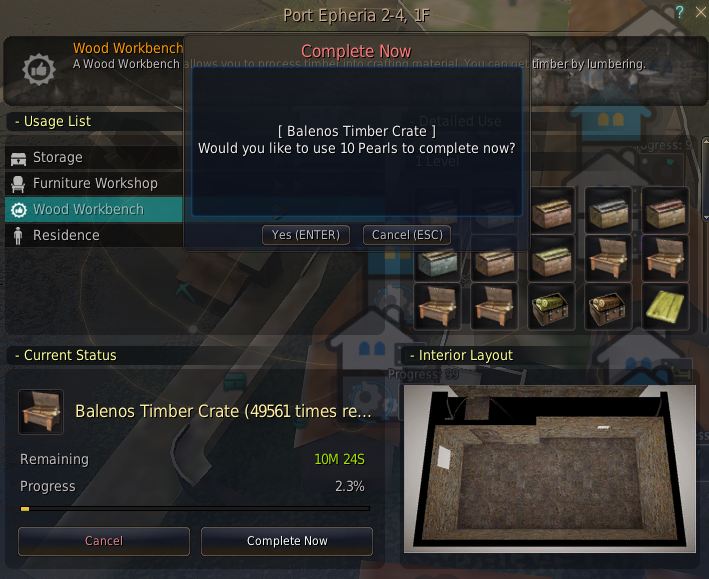 When using fort items such as Flame Tower and Hwacha, area available for installation will NOT be shown unless there is a valid fort around. The edit history of hair part in the character customization will now show correct modification history. Fixed the scroll glitch that happened after clicking on the Check In All button for pets. (Updated) The issue where Storage Maids opened up storages in locations outside of their functional region has been fixed. Migg, SoDogeWow, Amarenda and 5 others like this. nethkhadar, Asami and GEPPY like this. DAOWAce, OGGG, Rivian and 20 others like this. Every week I stop and think to myself, "How can they possibly make it worse this week?." Using Storage Maids will now direct you to the nearest available storage instead of the storages of restricted cities. Every week, they actually manage succeed. I'm kind of impressed. Skimmer, Nox Demon, OriginalVNM and 26 others like this. rangerx97, Nepheisa, Scixer and 39 others like this. deathtrip, Vulgris, DeltaTiger and 6 others like this. T800, Dalenos, Ciarilly and 6 others like this. GoyaSupremo, Haido, Firepulse and 2 others like this. "Blacksmith Techton has come back from his summer vacation. He is ready to assist." Rulupee’s World Travel Season 2 will start soon. We are preparing you an event page! Blacksmith Techton has come back from his summer vacation. He is ready to assist. Cinnae, PsykeCyanide, Scixer and 28 others like this. Ludakriss and Ebba like this. Rivkah, RoidRaged, DAOWAce and 31 others like this.